The Adobe Youth Voices Summit brings young people from around the world to learn about digital media tools, create videos, and learn how to tell stories that pack a punch. The 90-second movie starts with the image of a teacher squeaking out text with a marker on a whiteboard. Bored students click their pens and tap their fingers on their table. A school bell rings, smart phones ding, and insects buzz. These "organic" sounds accompanied by arresting images create a compelling background against which a group of young people briefly explore the challenge of education globally. As 18-year-old crew member Eva Miller explains, the video, titled "Noise in Motion," examines how those who want education often "can't get it and the people who have it don't want it or don't appreciate it the way they need to." That same message resonates for a student from Pakistan who's part of the same project (but declined to be identified), "In my country, some people don't like to send their daughters in the school. They are 12 [or] 13 years old. They can't go to school. But the boys, they can [get] the chance to go." Education was a theme in several of the videos produced during the Adobe Youth Voices Summit 2013, a weeklong event in August that drew 66 teens and half as many educators from 23 countries. The participants gathered at Santa Clara University and Adobe's headquarters in San Jose for a week of creativity, collaboration, and training on digital media tools. The goal of the program is "to ignite creative confidence," said Patricia Cogley, Adobe Youth Voices (AYV) program manager. "A lot of these young folks are coming from more challenging situations. But all of them possess really great leadership skills that we want to encourage." As these students find their "voices," they also learn how to use Adobe products better and make global friendships that could last a lifetime. The Summit grew out of Adobe's AYV program, which started in 2006 and has expanded to a thousand schools and after-school settings. Sponsored by the Adobe Foundation, AYV teaches young people between 13 and 18 to create videos, animations, photo essays, presentations, music, and other forms of media "with a purpose." Adobe provides funding, software, and curriculum. According to Cogley, about 32,000 students participate each year. At one point, the program organizers pondered what it would like to bring a group of students to an in-person event in which they could work together on a media project. "We wanted to take this program that's in many different locations around the world and have one very intensive week where all of the elements of the program came to life," said Cogley. Because the educators running those AYV groups were "key" to the program, she added, "we wanted to bring them too, so they could exchange their best practices." So they tried it out and liked what happened. Since then the summit has taken place every two years. Students apply by submitting an essay about their interest in digital media and creativity and what issues they're "passionate about." They also submit samples of media work to demonstrate their story-telling skills and abilities to use Adobe tools. 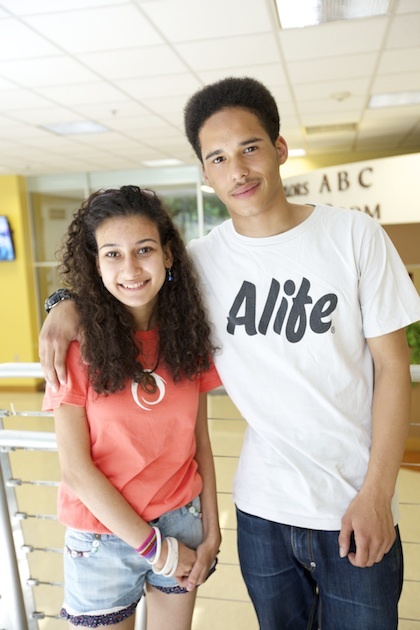 Through that application process, AYV chooses two students and one educator from 30-plus locations to attend. The foundation picks up all travel expenses. The event kicks off with a rousing keynote delivered by a filmmaker "who's really used their tools to make a positive difference," says Cogley. This year's opening speaker was Lee Hirsch, the filmmaker who made the well-publicized documentary, Bully, and founded The Bully Project, described as a "social action campaign" to stop bullying. During the week, the attendees have the opportunity to mix with artists, creative professionals, Adobe employees, and people from youth agencies and organizations, such as the Department of Education and TED Conferences. The students are divided into teams of eight. Those teams get two and a half days to produce their 90-second videos. That includes nearly a day for working out their themes. The Summit follows a rigorous schedule. Participants are up at 7:30 and at work by 8:30. Projects continue into the night, unless there's a special activity, such as a field trip to San Francisco. "What we try to do with the Summit and with Adobe Voices in general is mirror the professional stages of creating media," Cogley stated. "So we put a lot of attention on that idea generation stage because it's so essential in the creative field. We put a lot of attention on how you share your idea so you're engaging an audience. Then as they go into production, the focus is on how they work together as a team, on the collaboration, on their flexibility — how they can adapt to change. As the young people work through the stages of production, Adobe employees step in to guide them, provide feedback, and show them how to use the Adobe products most effectively. The teams are also led by "media mentors," artists who know how to facilitate young people. The main programs used by the students include Adobe Premiere Pro for editing, After Effects for visual effects, and Photoshop for digital imaging. Some participants come with a lot of experience with the tools. Others learn as they go. Participants also get a heavy dose of group dynamics. Because they've worked in teams as part of AYV, "they're familiar with the importance of collaboration, so that probably helps," said Cogley. "But people go through different stages of total excitement and the [opposite] — 'Oh, my god, it's not going to work out...'"
Heba Elshatoury (left) attends 12th grade in Egypt. Connor Paul (right) attends St. Charles Catholic Sixth Form College in London. That team challenge is compounded by the complexities of having to work with people from different cultures and speaking different languages, all trying to settle on a single topic for the project that every member of the team can get "passionate" about. "But they get along really well," insisted Cogley. "That's something we've seen at other summits, and we're seeing it again this year. We're just kind of completely amazed at the positive attitude everyone brings to it — how open people are to bringing their ideas forward and listening to each other." Heba: "The message of this film is that language is not the barrier and that together we can still build a community." Conor: "We're essentially doing a video with people who speak different languages and making them have a conversation in two different languages. Two students sit together and choose a community topic that they want to speak about -- violence, poverty, racism, whatever it is. The discussion is going to be for 20 seconds." Conor: "The brainstorming process. This whole project is pretty much community based. We're not making an aesthetic film. It has to have a purpose. It took some time to come up with the idea." Heba: "We're talking about violence, because after the revolution a lot of people pull guns. The weapons were everywhere in Egypt. We're including our own issues in the discussions." Meanwhile, the educators who attend are on a completely separate track. "They're really focused on how to improve and enhance their teaching practices so they can enable more creativity in their classroom," Cogley said. That includes sharing best practices they've picked up in their own instruction, hearing from Adobe staff members who show them how to use different tools to enhance the projects being created by their students, and — this year — learning more about "design thinking." According to Cogley, "design thinking" is an approach to product design that involves a lot of creativity and collaboration. "It's a way to organize group thinking around one idea so that it leads to a final product," she says. "It's a helpful tool for educators because with the creative process, it's great to generate a lot of ideas, but it's also great to really structure that process so that the best ideas come forward and everyone's involved." By Friday night, the young producers have the chance to share their projects with an audience of about 500. This year's projects focused not just on education, but also cultural exchange and using difference as a strength for creation. Then the students head home, encouraged to share what they've learned with their own communities, equipped with new technical skills and greater "global understanding." But even more, said Cogley, these young and energetic filmmakers now know how to "to pursue an idea in a short amount of time and get a lot of support from people around that idea." 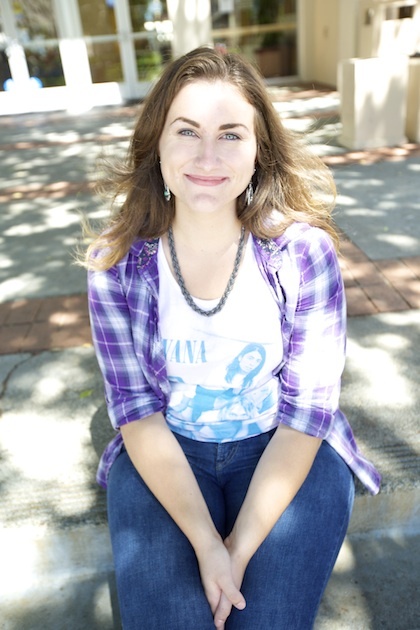 Eva Miller is an 18-year-old freshman at California State University, East Bay. "We're all sharing tasks. If one doesn't know how to do something, and another does, they'll work on it together to improve each other's skills and get our project done." "I've made a couple of films before, and I love Premier and just getting to know more about it. There's always something you can know more about Adobe programs. There's so many things you can do with the software. It's amazing."